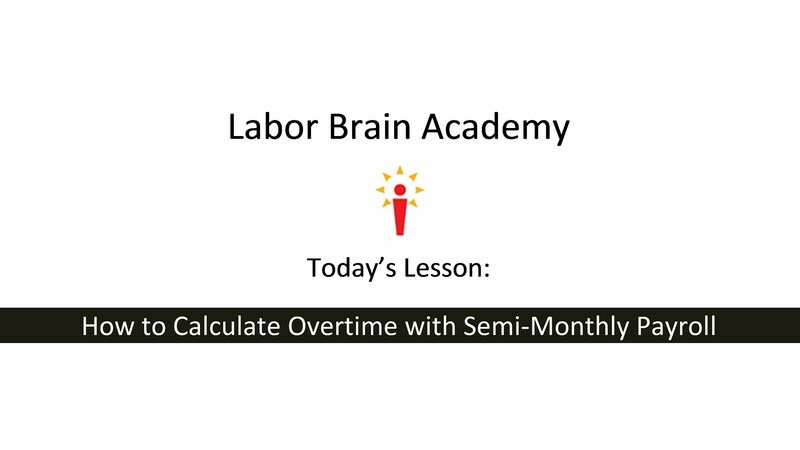 Semi-Monthly Payroll - The Labor Brain Inc. If you pay your employees twice per month – proceed with caution. 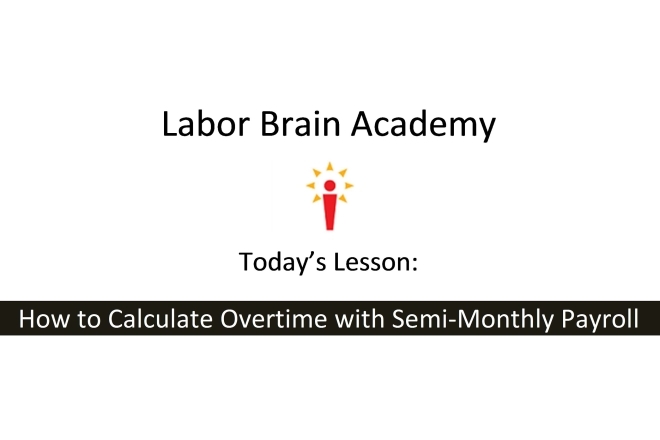 Companies that pay on a semi-monthly basis are at a significant risk for overtime violations. Employers choose to pay semi-monthly (twice per month), usually on the 5th and 20th or the 1st and 15th, for two reasons: it corresponds to monthly accounting and it’s cheaper because they pay to process 24 payrolls per year rather than 26. Employers choose to pay bi-weekly (every other week) because it neatly encompasses two workweeks and federal labor laws are applied on a workweek basis. Federal law (Fair Labor Standards Act) requires overtime payment of time and one half an employee’s regular rate for every hour over 40 in a seven day workweek. There are a few exceptions to the rule but it applies to the vast majority of companies and employees. The frequency of payroll has no effect whatsoever on the overtime laws that apply to a company. So that means no overtime over 80 hours in a two weeks, or 88 hours or 86.67 hours in a semi-monthly period. With the advent of electronic time keeping and payroll systems it is possible to pay on a semi-monthly basis and stay in compliance with overtime regulations as long as the computer system has been set up correctly. These systems will track overtime on a weekly basis (Sunday – Saturday or whatever workweek the employer has designated) even if the current semi-monthly period started or ended midweek. This means that in any given pay period the computer will be looking back into the preceding pay period and capturing any unpaid overtime hours that were worked in the workweek after the preceding semi-monthly pay period ended. This employer has designated his workweek as Sunday – Saturday but pays on a semi-monthly basis (1st – 15th and 16th – end of the month). When calculating how many hours are owed this employee for the 2nd period of the month most employers would count the total hours worked from the 16th – end of the month and pay a total of 94 hours including two hours of overtime from the last week of the month. Most employers don’t realize that they are also required to pay for the 3 overtime hours that occurred in the third week of the month. If you are going to pay semi-monthly you should have a properly set up electronic time keeping system or a competent administrative staffer with extra time to devote to payroll calculations. We hope you found this week’s tip helpful and informative. Please pass it along to anyone you think might be at risk as a result of paying on a semi-monthly basis. Follow us on facebook to get a weekly tip update on your news feed! Check out our YouTube video on this topic! The Labor Brain Inc. is not a law firm and its employees do not practice law or provide legal services. The information provided on our website, in email correspondence with representatives of The Labor Brain, and at outreach events is for informational and educational purposes only. The information provided is not a substitute for the advice of an attorney.